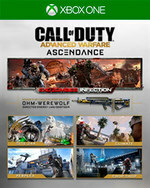 Prepare for Ascendance, the second downloadable content pack for Call of Duty®: Advanced Warfare, including: - Exo Zombies: Infection – Part Two of the Exo Zombies co-op experience introduces an expanded map with terrifying new enemies. - Four unique Multiplayer Maps enabling more exo-driven verticality. - Bonus Weapon: Devastate the competition with the OHM Directed Energy 2-in-1 LMG/Shotgun and its OHM Werewolf Custom Variant. - Plus the all-new Exo Grapple Playlist: Activate your Exo Grapple Ability for a faster way to reach strategic vantage points or as a brutal secondary weapon to take down the competition. Ascendance is a good DLC pack for Advanced Warfare, and hopefully we’ll see more of this going forward. The competitive maps are fun and varied, and the grappling playlist is an entirely new way to play the game. Exo Zombies got the shot in the arm that it needed, feeling less sterile and more fun. With two packs to go for Advanced Warfare, we’ll see what Sledgehammer has up their sleeves for the second half. Call of Duty: Advanced Warfare doesn't really have a killer Season Pass so far, but if you're still into zombies, it's worth the investment -- mostly because you can't even access the mode without buying some form of DLC. There are a few flashes of brilliance in the maps delivered in Havoc and Ascendance, but I'm hoping that John Malkovich and the crew won't have to carry so heavy a load for the next two add-ons. Puede que no sea el pack de contenidos más brillante que hemos visto para un Call of Duty, pero sí uno muy completo. Dos de las cuatro localizaciones consiguen ofrecer algo diferente, a lo que se suma el añadido del gancho, que cambia la cara por completo al juego de Sledgehammer Games. ...Y el arma extra también es una novedad a agradecer. Su precio, el de siempre, elevado si no eres acérrimo de este juego. Le voici enfin, le véritable contenu additionnel de Call of Duty Advanced Warfare ! C'est lui qui aurait dû ouvrir les hostilités, au lieu du mignonnet Havoc. Ascendance a quasiment tout pour lui : des nouvelles cartes multi inspirées, un gadget inédit impliquant des modes spécifiques captivants et une mission Exo Zombies complète. Que demander de plus ? Ah oui, qu'il eût été implémenté directement dans le jeu de base... Oui mais que voulez-vous, c'est la crise. Geconcludeerd kan worden dat de Ascendance DLC perfect aansluit bij de Advanced Warfare gameplay. De nieuwe mappen spelen lekker, maar het is nog afwachten of het echte klassieke mappen worden of weer dertien in een dozijn zijn. Als je op zoek bent naar een uitgebreidere Call of Duty ervaring dan is deze DLC een aanrader, anders kun je jouw zwaar verdiende centen sparen voor Call of Duty: Black ops 3.